I modified my other turkey taco chili recipe for the Instant Pot. This is an easy to make, healthy chili made with turkey and fresh tomatoes. 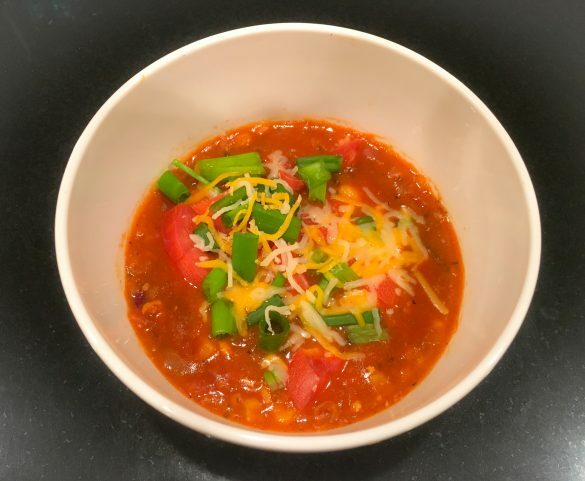 My husband and kids love this chili and I love it because it’s just healthy and full of protein. It took me a total of 55 minutes to make my turkey taco chili from start to finish. 1. Hit the ‘’Saute’’ button on your Instant Pot. Saute the ground turkey in your Instant Pot, using a spatula to stir it for approximately 5-6 minutes until cooked through. Add in the minced onion and cook it with the turkey until the onion is translucent. 2. Add in the kidney beans (drained and rinsed well), refried beans, corn (drained), 3 tomatoes worth of the chopped Roma tomatoes (save the rest for garnish), and the marinara or tomato sauce. Mix well and stir in the taco seasoning. 4. Make sure the steam release valve is in the ‘’Sealing’’ position. Press the ‘’Bean/Chili’’ button to begin cooking. Do not make any changes to the pressure. It will cook for 30 minutes. 5. After 30 minutes, you will see the pot switch to the ‘’Keep Warm’’ setting. Allow the pot to reduce in pressure naturally and do not open the steam release valve. When pressure goes to low keep waiting. You will see LO and the number of minutes it is LO. When the display says “LO 5”, meaning it has been in the low position and keeping warm for 5 minutes, open the steam valve and allow it to release the pressure. You may want to put a paper towel over the steam valve so that it doesn’t spray. Carefully and slowly open the lid when the steam is done releasing. 6. Serve the turkey taco chili topped with shredded cheese, chopped tomatoes, green onion, sliced avocado, and if desired sour cream. I recommend doubling this recipe if you have more than 4 people or if you want leftovers. *If you need more liquid add more marinara sauce or tomato sauce.